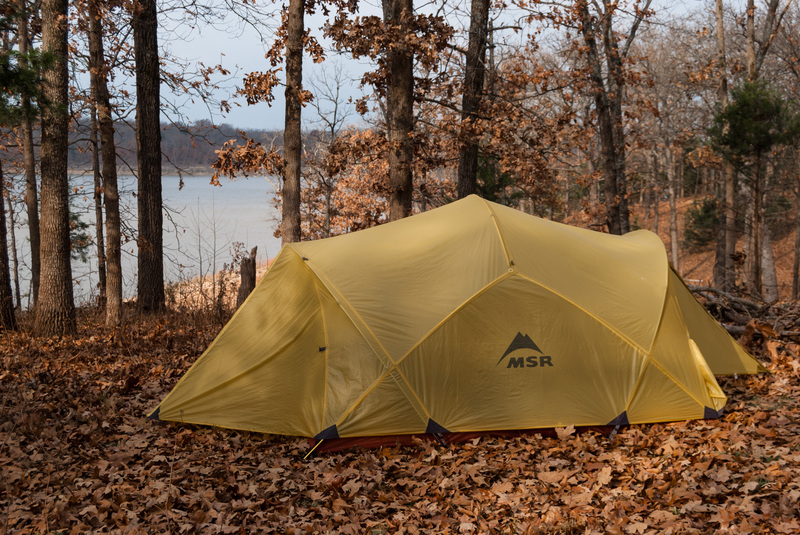 Our new MSR Mutha Hubba tent at Berry Bend Campground. Copyright © 2010 Gary Allman, all rights reserved. Our Mutha Hubba tent on it’s first outing at Berry Bend campground on Harry S. Truman Lake. We spent a long time researching and looking at tents. Each time we thought we’d found the one we wanted we saw another we liked even more. A three season tent was essential for spring and fall camping, some useable vestibule space that could double as a wind break for cooking if needed was also high on our wish list. It had to be big, or even a three person tent so that we can keep our packs inside if the weather was really foul. After a long search the prime contender was The North Face Madraque, but we couldn’t find any reviews, nor could we find anyone locally that stocked it. We had a play in the The North Face Minibus, and nearly bought one, but the oh so cutsie design put us off in the end. Popping into Dynamic Earth (something we do too much of at the moment) we had a look at the MSR Hubba Hubba which was far too small for our needs, and finally the Mutha Hubba, which was nice and roomy. It’s meant to be for three, but it fits two just right. We were very impressed with how light and easy to set up it was, the build quality looked very good too. We went away and checked the reviews (almost 100% positive) before buying the tent and footprint. In use we’ve found it very easy to set up, the footprint is an absolute essential, protecting the base of the tent, and also holding the tent poles in place. That lets you use the flysheet only, or in the rain, you can set the flysheet first and then set up the tent – enabling you to keep the tent dry. The aluminium tent poles are a joy to set up, and we loved the way they just push into grommets on the footprint, tent and flysheet. It’s a much simpler arrangement than the ‘Jacks Foot’ used on some other tents, which we thought might be prone to breaking as it is plastic.